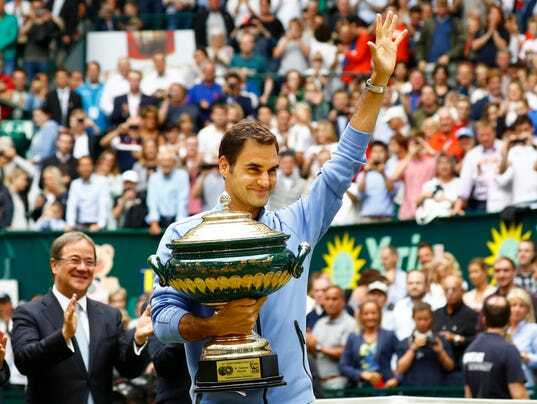 HALLE, Germany (AP) — Roger Federer defeated Germany’s Alexander Zverev 6-1, 6-3 to win the Gerry Weber Open for a record ninth time on Sunday. Playing in his 140th career final, Federer saved the only break point he faced and converted four of his eight opportunities to clinch his 92nd career title in 53 minutes. At 35, the Swiss player became the oldest winner of the grass-court tournament. Federer, who skipped the clay-court season after winning the Miami Open in early April, claimed his fourth title of the year, matching Rafael Nadal’s tally, and he will be seeded ahead of his Spanish rival for Wimbledon, which starts in eight days.